WAV, also called pulse code modulation (PCM) or waveform audio, is an lossless uncompressed format. It has become a standard PC audio format with CD quality for most systems. Many players such as VLC, iTunes, QuickTime Microsoft Groove Music, Winamp all support it very well. Another reason why many audiophiles prefer WAV is because it has great quality up to 1411Kbps, other formats like MP3, M4A fall flat when listening on high end speakers or headphones. 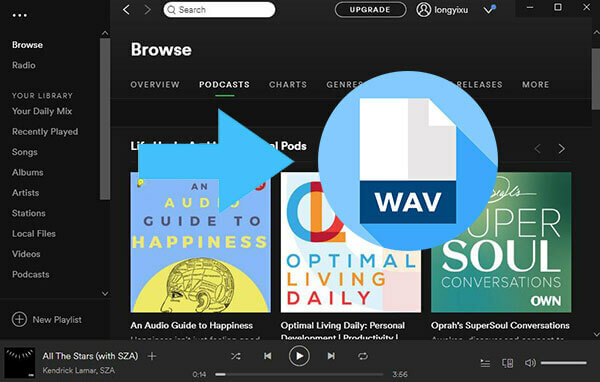 Here I will show you how to convert Spotify to WAV songs. When it comes to Spotify music, one thing you need to note is that they are encrypted with the digital rights management protection. You can't get the songs out of the Spotify's ecosystem even if you subscribe to the premium membership. For example, on the premium account, you are allowed to cache the OGG music files for offline listening but you can't move the OGG elsewhere because they are encrypted. So what can we do now? Someone may recommend the free Spotify to WAV recorder online. I have actually tried them but they don't work as I want. When recording the songs, some audio noise are added randomly. In this case, if you'd like a tool with lossless output quality, I'd suggest you the DRmare Spotify WAV Downloader for Mac/Windows. It is developed with a stand-alone virtual sound card which can automatically capture the sound data online and save them as WAV format. Since there is not unnecessary recording and transcoding processes involved, the data can be kept maximally. Automatically search and keep the ID3 tag info, meta data, album cover, etc. 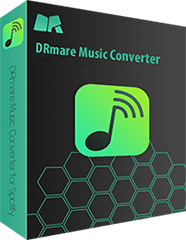 DRmare Spotify Song Converter has passed the international CMMI3 software standard. It is easy to use and powerful. Anyone can use it as the first glance. Even people with visual impairment can use it by using some system voice assistant tool. Both Windows and Mac version work in the same way. Now let's find out how. 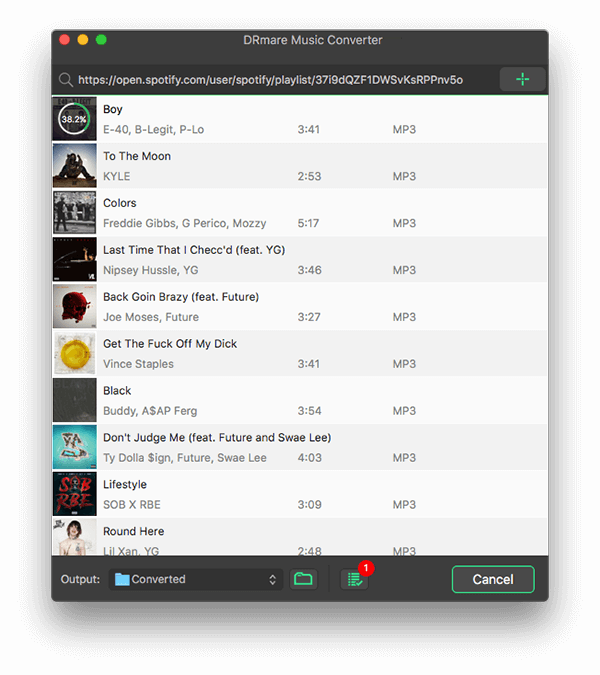 To capture the song from Spotify, you can drag and drop the tracks, playlists, artists or station etc. to the Spotify main screen. DRmare application will understand what songs you want and connect to them directly. 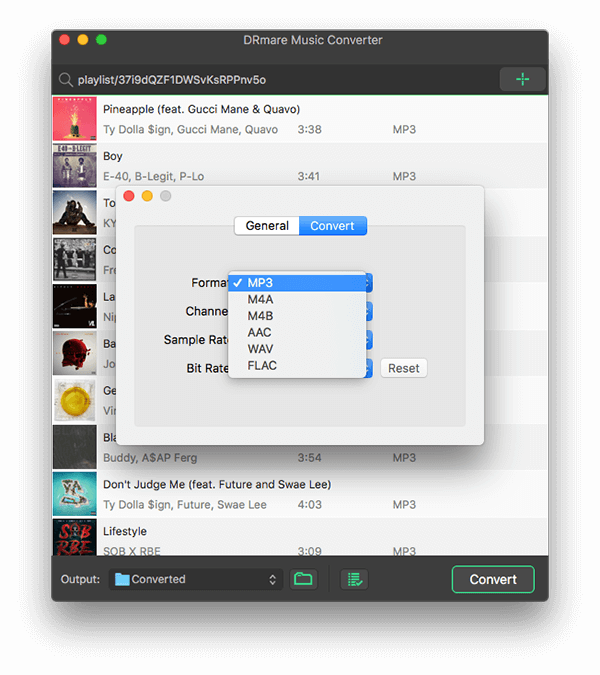 Step 2Adjust output format as "WAV"
DRmare Spotify supports lossless formats such as FLAC, WAV. FLAC is compressed while WAV is not. I'd suggest you choose "WAV" so that to keep the original raw audio format with best quality. The bit rate and sample rate will be changed to 1411Kbps and 48000Hz automatically. After doing the settings, you just need one click of the "Convert" button to start the downloading process. Generally the time it consumes depends how many files you added, but it shouldn't be long to get all your new WAV files with the 5X converting speed. 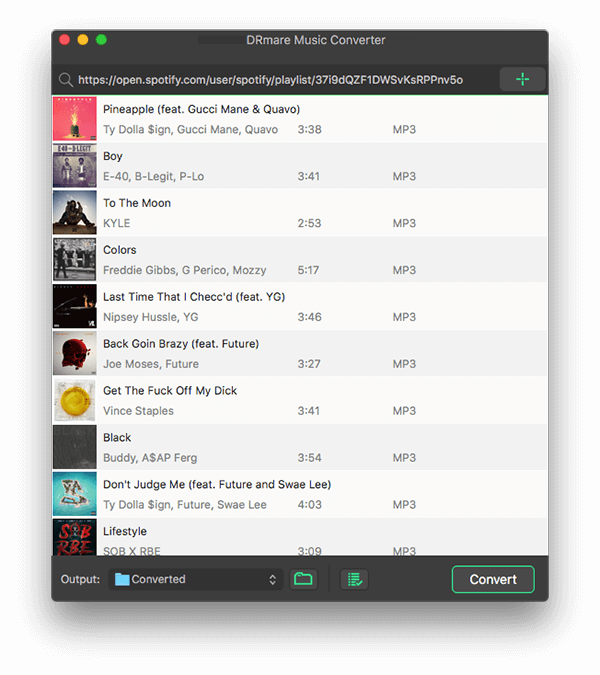 The following video guide will show you the complete steps to download and convert Spotify music to lossless WAV by using DRmare Spotify Music Converter. Now you have downloaded and converted the Spotify OGG to WAV, you can transfer and play the WAV songs on your high end earphones etc. If you just want to enjoy Spotify on MP3 players, it is also a good idea to convert the songs to MP3. For more info about the difference between the formats, you can refer to the following part. OGG Vorbis is a free, open container format designed for efficient streaming manipulation of high quality digital multiple. Because it is unrestricted by software patents, many streaming music sites such as Spotify use it as the standard format for storing their music. But since the OGG Vorbis from Spotify are encrypted, you can't play it elsewhere except Spotify. MP3 is a standard technology and format for compressing a sound sequence into a very small file while preserving high sound quality. It has a wildest compatibility. The quality is lower than CD's, but you shouldn't hear any differences when listening the songs on common MP3 players such as Zune, iPod, CreatvieZen, iRiver. WAV is a Microsoft and IBM audio file format standard for storing an audio bitstream on Windows PCs which is similar to AIFF, ALAC on Amiga and Macintosh computers. The best part of it is its great audio quality which is same to CD. The file size maybe 10 times of MP3. But considering that most hard hard of today all have super big capacity, it won't be a big problem for most users. Do you have any questions? Just leave your comments below, we will provide you further assistance.